Front row from left: BU President, Dr. Gervan Fearon, PENT students Sherelle Day and Ernestine Okemow (with family members), Dean of Education, Dr. Heather Duncan, and PENT Director, Dr. Ken Friesen at the PENT iPad Initiative Celebration Luncheon. 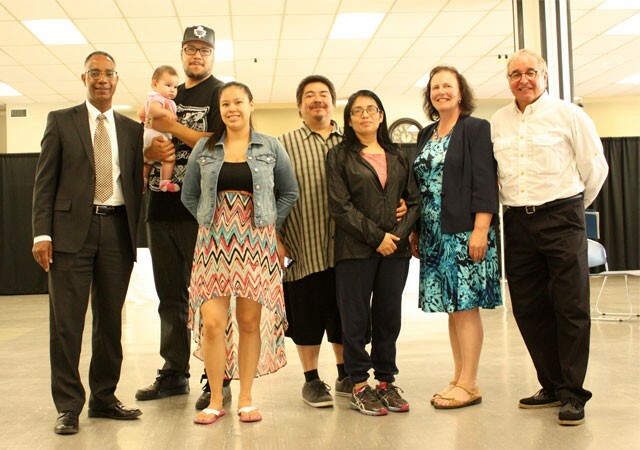 BRANDON, MB – Through fundraising efforts over the past year, led by alumnus, Gerald Butler ’63, Brandon University has provided iPads for all students enrolled in BU’s Program for the Education of Native Teachers (PENT). These students hail primarily from Aboriginal, northern, and rural communities across the province and are working towards an Integrated Bachelor of Arts/Bachelor of Education degree. Many of these students already have some in-class teaching experience and the degree program allows them to make further contributions to their communities and students. In conversations initiated by Gerald Butler with PENT students and BU faculty and staff, it was determined that one of the key barriers facing Aboriginal educators is their access to appropriate technology for both classroom work and their individual coursework as PENT students. Thus, the BU iPad initiative was born. Thanks to Mr. Butler’s fundraising efforts which raised $36,600 in gifts from private donors, The Cardinal Foundation, the Thomas Sill Foundation and The Winnipeg Foundation, the iPad Initiative has been successfully launched and has provided all 100 students enrolled in the PENT program with the latest technology in support of their educational goals and teaching practices. Additionally, it propels PENT participants to the front of the line in terms of the integration of technology into teaching practices at Brandon University and in many of their communities. Apple has provided additional support in the form of a Technical Consultant who has come on-site to provide students with orientation and training on the use of their iPad. “Technology can help students acquire the skills they need to survive in a complex, highly technological knowledge-based economy,” says Dr. Heather Duncan, Dean of Education at Brandon University. A program through The Manitoba First Nations Education Resource Centre, Inc. has distributed iPads to each student in northern Aboriginal schools within Manitoba. Thanks to the PENT iPad initiative launched by BU, the educators of these students will now be able to return to classrooms in their communities equipped with their own technology and knowledge of what an iPad can bring to the classroom, enabling them to make learning more relevant and meaningful for their students.